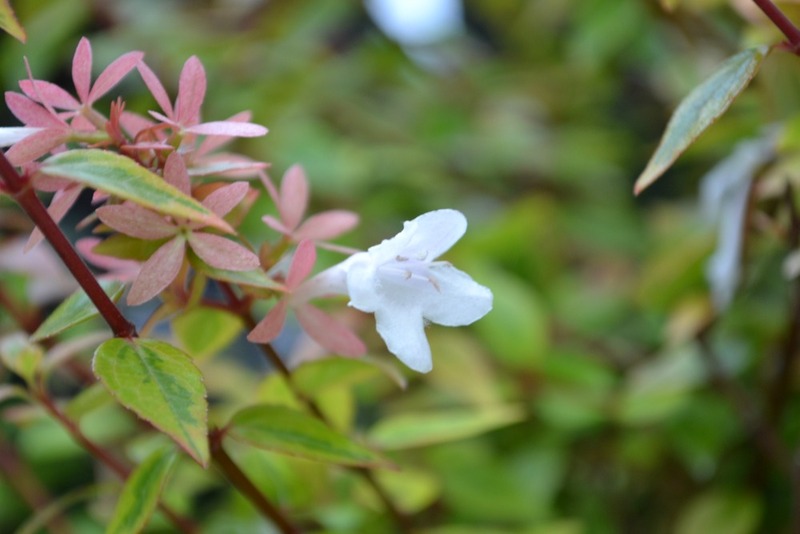 Abelia ‘Kaleidoscope’ – This evergreen shrub is a stand out with lime green and deep green variegated foliage. This unique Abelia variety has it’s “roots” in North Carolina as it was actually discovered by local grower when the unique foliage appeared as a “sport” from Little Richard Abelia. 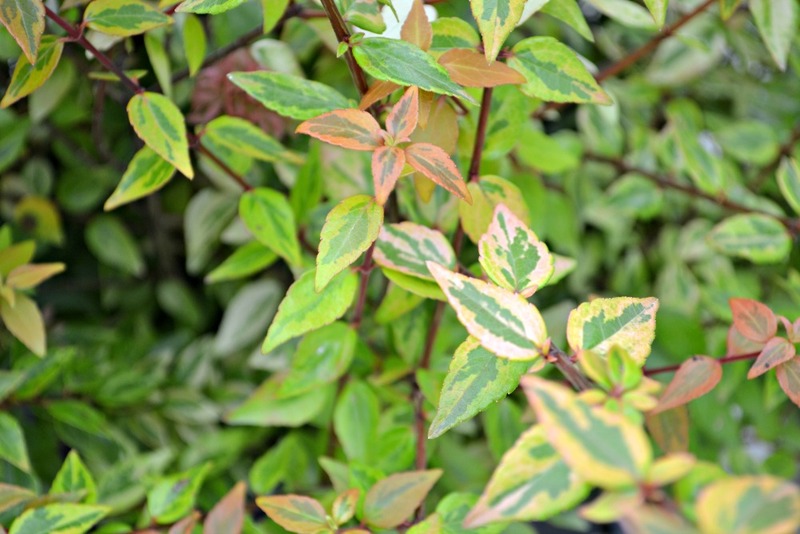 The new growth of Kaleidoscope Abelia appears reddish-pink and fades to the variegated greens on older foliage. Abelias produce small, white flowers for most of the spring and summer season. 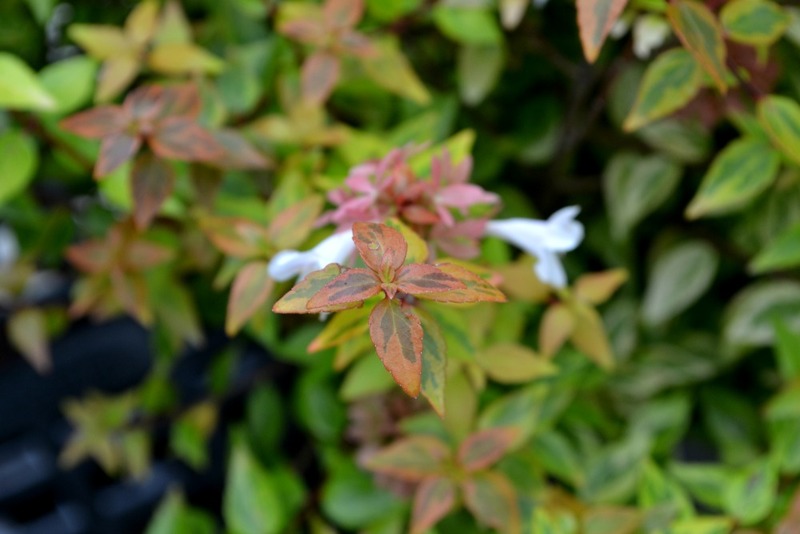 One of Abelia’s beautiful surprises is the glorious reddish-orange leaf color in cooler temps. Kaleidoscope Abelia has a dwarf growth habit growing 2-3 feet high by 3-4 feet wide. This compact, rounded form makes Kaleidoscope an easy and low maintenance addition to your landscape. 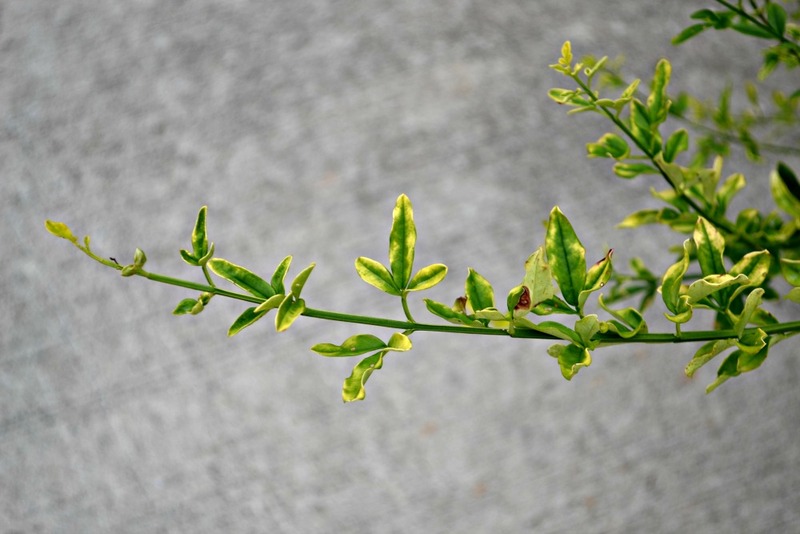 Euonymus japonicus ‘Aureo-marginatus’ – Golden Euonymus grows 6 feet tall by 3 feet wide. 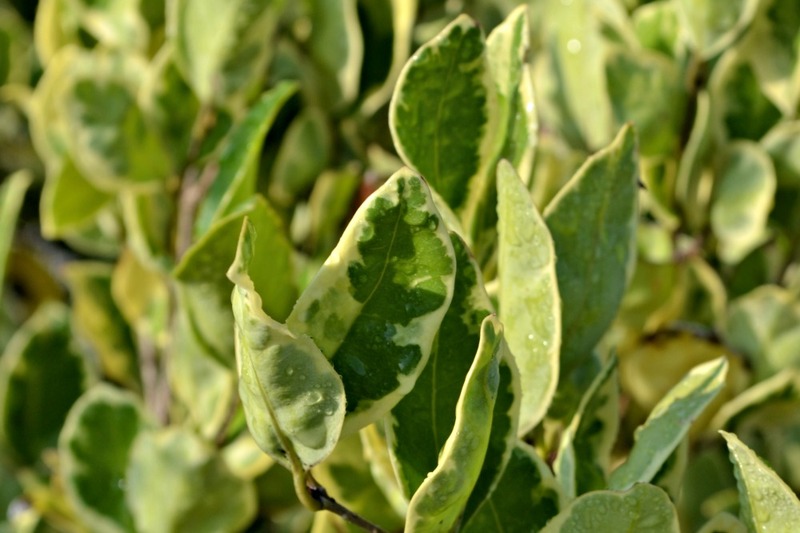 This Euonymus is highly tolerant of pruning and height can be easily maintained with regular trimming. 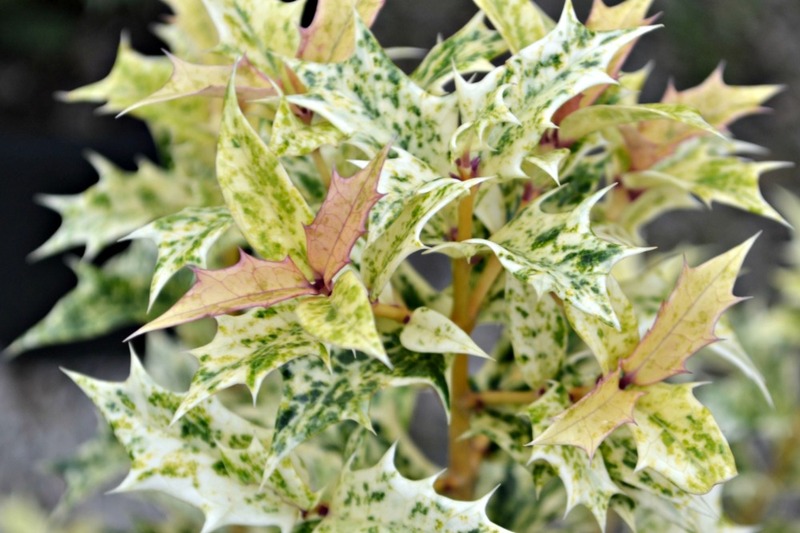 A full sun evergreen shrub that displays its boldly variegated foliage on a nice upright form. 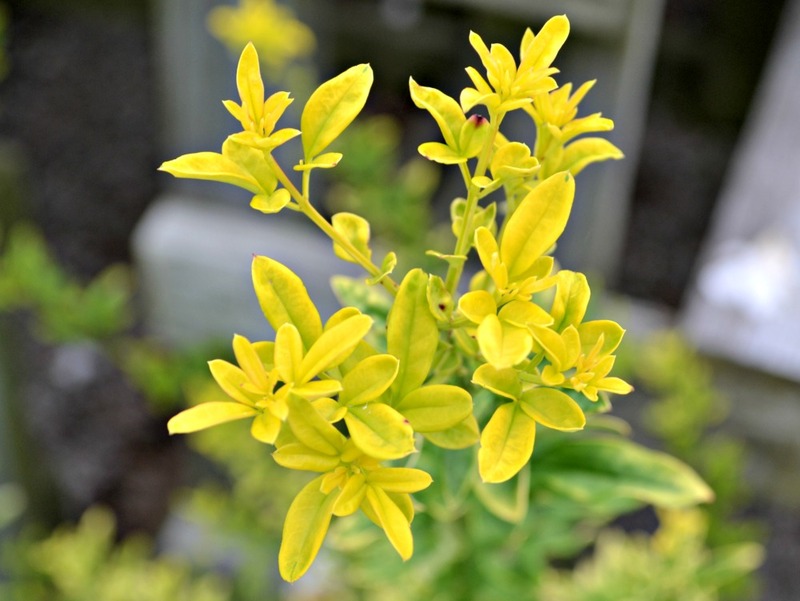 Golden Euonymus is an excellent choice for colorful hedges and can tolerate many poor soil conditions. Jasminum mensyi ‘Sunglo’ – Also called Chinese Jasmine., this variegated evergreen shrub blooms yellow in early spring through summer. 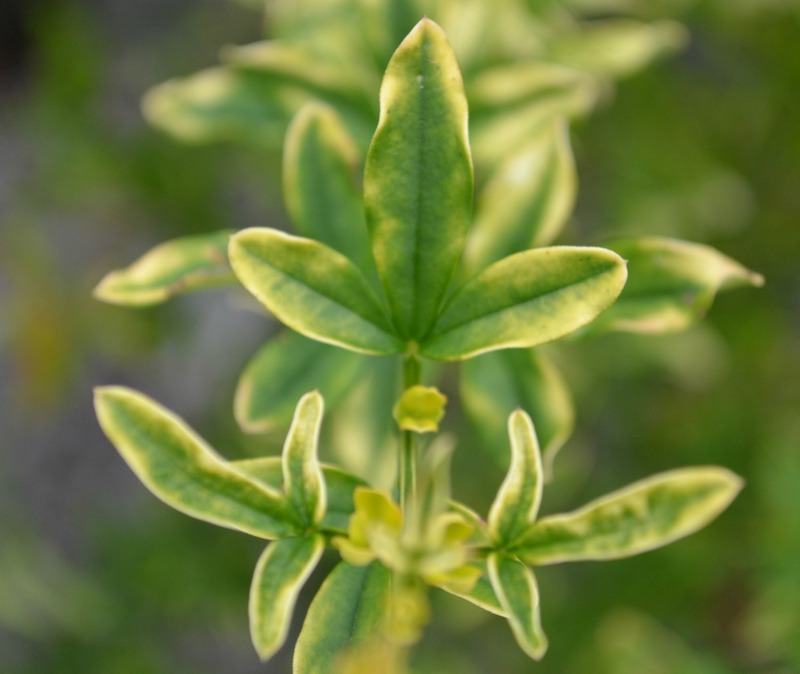 It has bright apple green leaves tinged with a darker green and a weeping growth habit. Primrose Jasmine likes some shade as it could burn in full sun. Primrose Jasmine has an upright to spreading habit, growing 6-7 feet by 8-10 wide. Lovely as a screen or specimen shrub. Keep it trimmed to show off the almost yellow new leaf growth and to control it’s size if needed. Water moderately. Deer resistant. Osmanthus heterophyllus ‘Goshiki’ – Goshiki translates from Japanese as “five colors.” The new growth is red but quickly turns green. Those green leaves are then speckled with creamy white, grey-green and yellow-green vareigation. 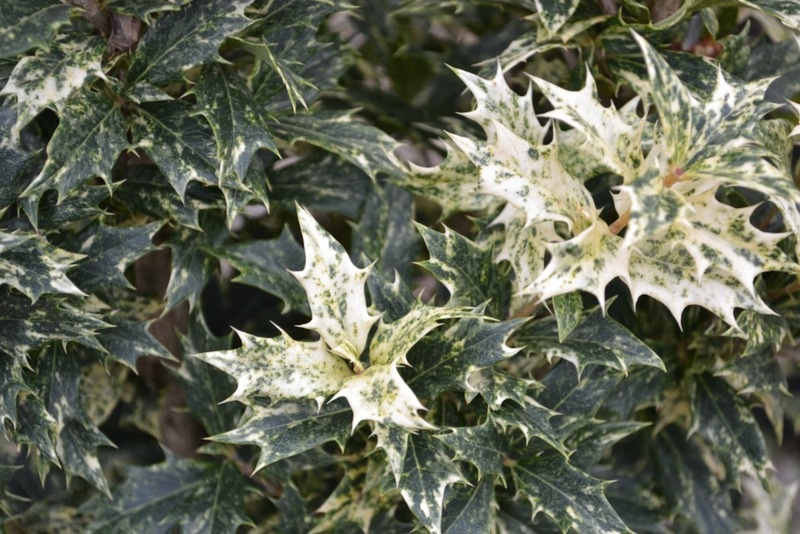 Goshiki Osmanthus makes a great hedge, foundation or stand alone plant. This shrub is a slow grower reaching 3-5′ high by 4′ wide in ten years. 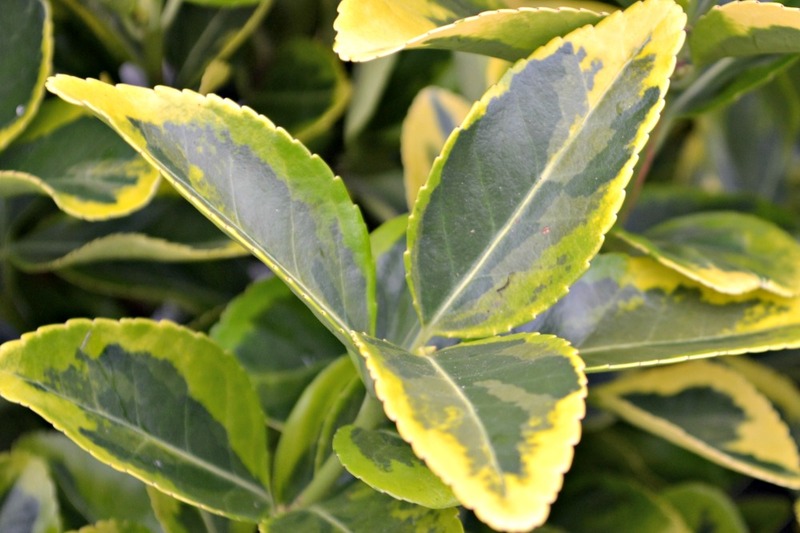 This evergreen shrub likes a full sun to part shade location with regular watering until established. 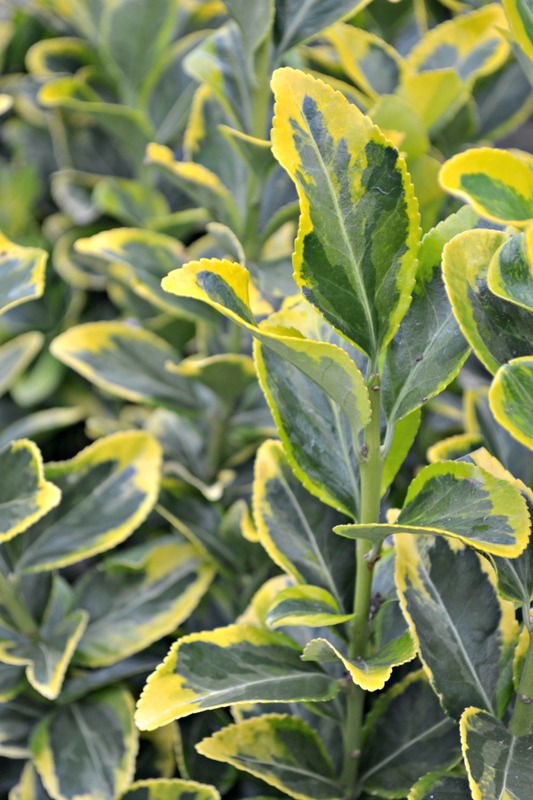 Ligustrum japonicum ‘Jack Frost’ – Shiny leaves appear leathery with creamy white edges. 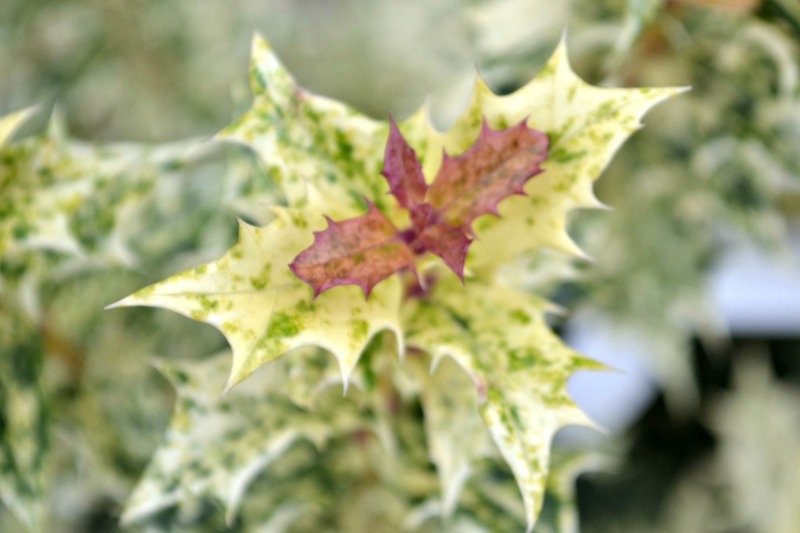 A striking medium sized evergreen, Jack Frost offers a great Spring bloom and “frosted” leaves to brighten any garden. Used well as a medium hedge or mixed border planting. 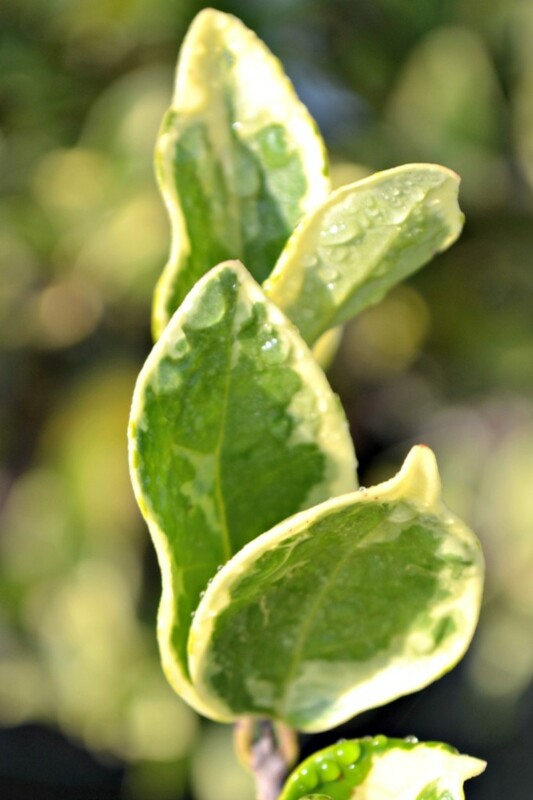 It’s hard to beat this very versatile, evergreen, hardy shrub for it’s showy color and easy care. This shrub needs full sun to part shade and can grow to 10 feet tall by 8 feet wide.